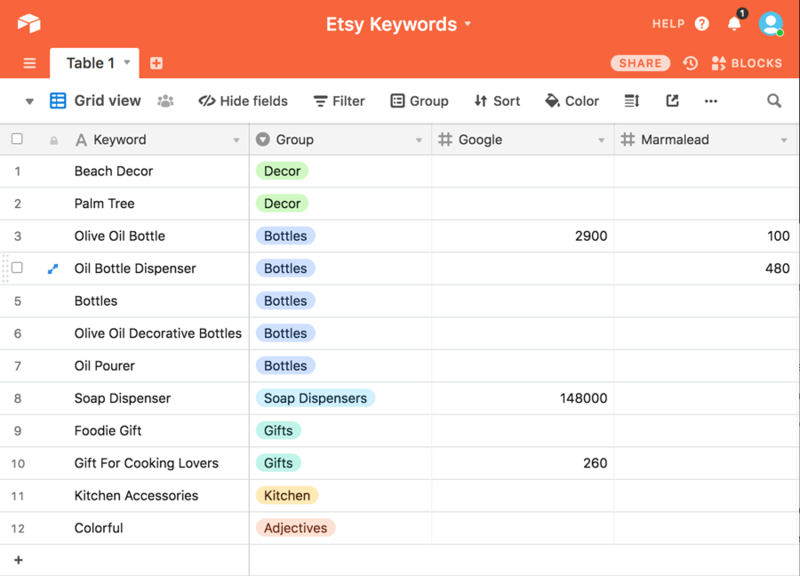 As an Etsy seller I do a lot of keyword research, but organizing all those Etsy SEO keywords and phrases was really getting me down. And then I found the most amazing free tool to use for keeping track of them! 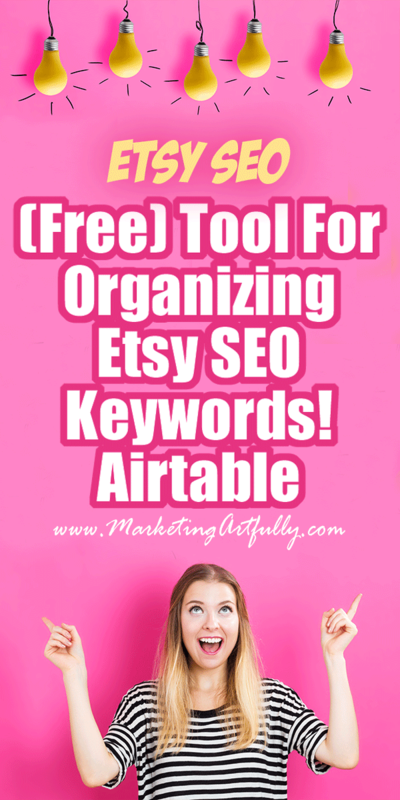 Here are my best tips and tricks for organizing my Etsy SEO Keywords! I have tried almost everything I can think of to keep them in order from Google spreadsheets shared with a friend, to Evernote and even just a Word document. The problem every time was that they quickly got WAY out of hand and I abandoned that method and tried something new. Luckily I found the PERFECT tool! 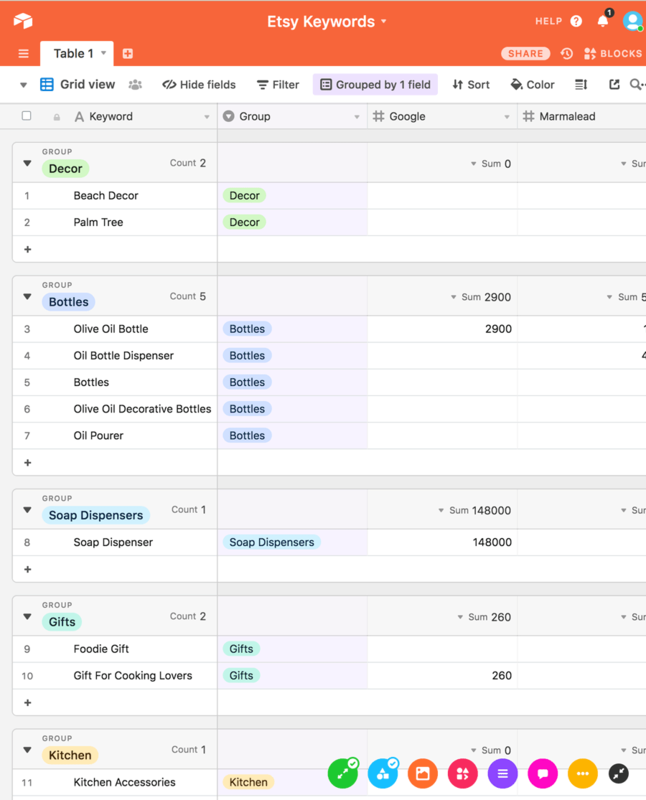 Airtable which is half spreadsheet and half super organizer! As you become more and more proficient in your Etsy SEO keyword research, you will have more and more “good” keywords that you can use. Keeping track of the ones that you have already found and vetted can make doing a new listings a breeze. BUT, maybe you are like me and sorta-kinda kept them in your head or did the research each time because you weren’t good at storing those keywords someplace easy to refer back to later. I use a number of different search tools to find keywords to use in my listings! 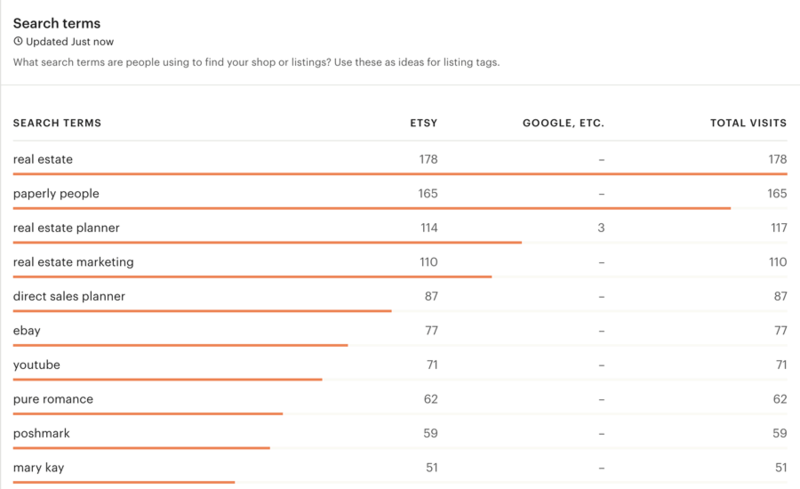 Oh, oh, oh, you could even check your Etsy stats and add the keywords that people have actually used to search for products like yours in the past! 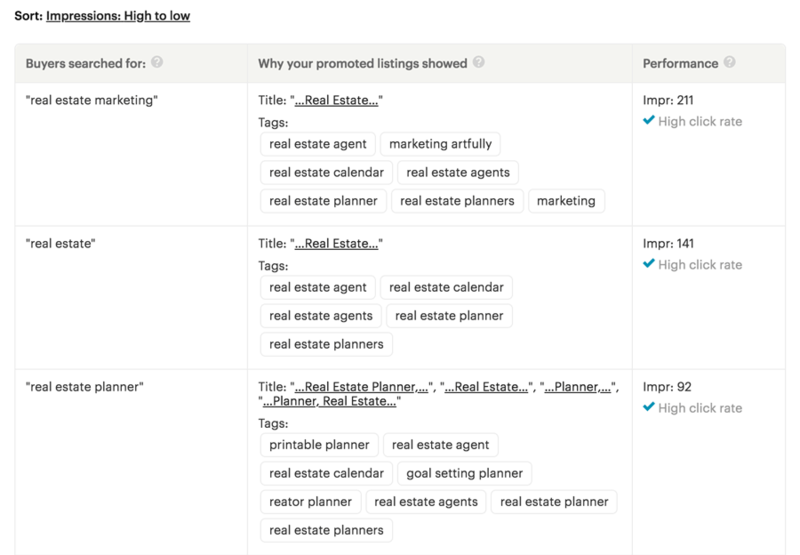 Or you could even add the ones from your promoted listings stats! Keyword – This is where you list all the keywords you have found to use down in a list. I KNOW, it doesn’t look very fancy yet, mostly what you can do in an Excel spreadsheet. But it is the sorting functions that will make you so happy in just a wee bit! The next thing you want to do is go to the arrow on the right side of the Group field name and click “Customize Field Type”. Choose “Single Select” and then put your sorting options in there. The cool thing about these groups is that you can reorder them (and your keywords) easily later by using the “handle” on the left hand side that is six little dots. The first way I show you how to sort in the video is by group. This puts all the pretty colored tags into the right order, all grouped together. The best part about this is that you can drag and drop them to rearrange them in any order you like (in Excel you would have to add a row, cut and paste the contents in and then delete the row you copied from). To stop sorting this way just click the X to the left of the “Sort by” words and it goes back to being just a jumble. If all Airtable had done was that I might have been happy but I wouldn’t be telling you about it. BUT WAIT, THERE’S MORE! You can use the “Group by field” to put them into little bunches that you can move around too! I know, it is a little confusing that I named my Groups “group” but that made it easy for me to remember what I was supposed to be sorting by! As you can see they are all in cool sorted order. 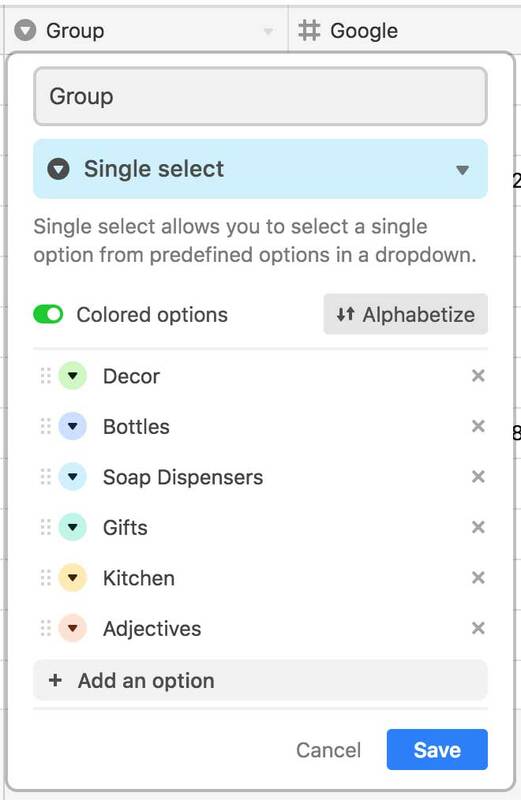 But if you want to rearrange them all you have to do is go back up to the Group > Customize Field dropdown and pick the first one, “Customize Field Type”. And then if you want to change the order you can just use the little gray dots handle to move them around and all go together as a group! 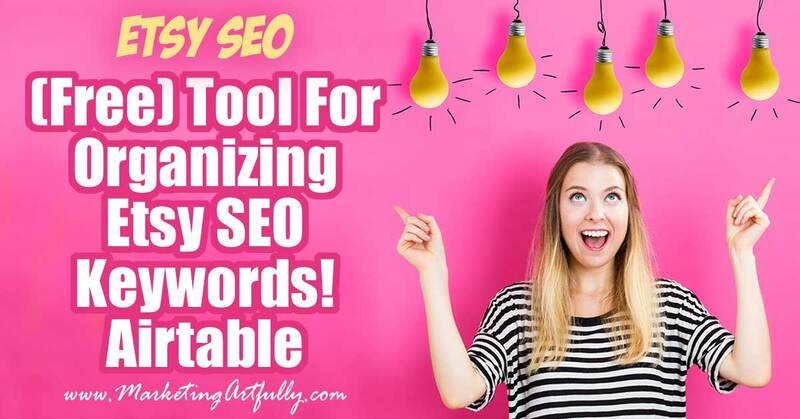 As an Etsy seller I am always happy to pay for things that make life easier or save me time, but I was super excited to find a free tool like this that would help you to manage your keywords. There is a paid function that gives you more colors for your buttons (I wish I had that) but I haven’t even come close to using all my records and on my blog posts sheet I have literally hundreds of posts listed with way more fields than we would use for doing keyword research!